Grimoires, magic book, spell book...whatever you call them these strange and mysterious tomes have been rumored of and spoken about for centuries. Whether they are playfully depicted in movies like Hocus Pocus or were used as a reason to steal people from their homes in the middle ages on claims of illegal witchcraft, you’ve probably stumbled upon a story of a spell book in one form or another in your life. But, what about when those spell books are discovered? Also known as ‘An Egyptian Handbook of Ritual Power’, the Coptic Spell Book is a scroll full of invocations and spells. It gets its common name, the Coptic Spell ook, because of the language it was written in. Coptic is an Egyptian language that is based on the Greek alphabet augmented with letters borrowed from Demotic, the first alphabetic script used for the Egyptian language. The book itself dates back to, approximately, the 8th century BCE and likely originated in Upper Egypt. Researchers classify it as a codex and it made from 20 bound pages of parchment. The text was originally discovered in 1981 when a researcher was going through the extensive papyrus collection at Macquarie University and it was recently translated by Malcolm Choat and Ianin Garnder. The book seems to be laid out purposefully. It begins with a series of invocations which eventually culminate in drawings and words of power. These invocations are followed by spells to cure various ailments, spiritual issues (including possessions), and finally spells to bring about desirable things like success in love and business. Who was this codex created for? It would not necessarily need to be a priest, monk, or another religious figure. Perhaps it could be used by those outside the ranks of the clergy or religious world. I certainly think this is a possibility because of the spells included, especially towards the end. While it would make sense to include healing spells and cures to ailments to a religious text for religious use, I think the addition of things like success and lay spells indicates lay-person usage. The above image is entitled Museo Archeologico - Milan. It is liscensed under CC BY-SA 3.0 and was taken by Jose Luiz Bernardes Riberio. According to Celtic lore, the year is divided into two halves, the dark half and the light half. The dark half begins on November 1st and is marked by Samhain. It was on the day of Samhain where the veil between this world and the otherworld was believed to be thinnest, allowing spirits to pass through. Like Hallow’s Eve, Samhain is also an ‘eve.’ Samhain preparations and celebrations begin early on Samhain Eve. Since Samhain marks the end of summer, families usually begin the day with an intense fall cleaning so they could begin winter with a fresh, clean home. Like many things, Samhain is all about balance. There were both good and bad spirits that could visit them during Samhain. Family’s ancestors and loved ones were welcomed into the homes of the living and celebrated while costumes, masks, and other creations were used to disguise and scare off the spirits that wished to do harm. The colors orange and black also have their origin in Samhain. The black represents the time of darkness and, according to some sources, the death of god(s) (linked to the sabbat Lughnasadh) and the orange symbolizes the hope of the coming dawn during Yule when god is reborn. Some believe Jack-o’-lanterns also have their beginnings in Samhain when turnips and gourds were carved into scary faces, hollowed out, and lit up with a candle in some cases. The horrific faces were meant to scare away bad spirits. However, there is also the belief that light leads spirits to the afterlife (which is why bonfires and lanterns are important to Samhain). Although some sacrifices were made they weren’t gruesome or uncommon for the time period. Typically crops and sometimes livestock would be burned in bonfires. These were offerings for the other side as a way to protect against evil and gain favor from the more malicious spirits that may try to malign or hurt the community. Bonfires also raged throughout the night. All of the community would come by the bonfire and enjoy food, drink, and dancing. Some members of the community would wear costumes, usually dressing up as fearsome animals, as a way to scare bad spirits away from the community. Because the veil was so thin it was also a popular time for human tricks. Many people played tricks, pranks, or got up to other mischievous business and instead of taking responsibility for these actions they were often blamed on fairies and spirits which were running rampant. In addition to tricks, Samhain was also supposed to be the best time to try your hand at divination. Divination was accomplished in a variety of ways such as throwing bones, reading tea leaves, and other means. Or, people who would not normally want or desire their future told feel the need to find out or ask by the light of the bonfire. Where does Trick-or-Treating Come From? A common practice called ‘Souling' is reminiscent of Halloween. In its earliest form (and likely with pre-Christian roots) Souling entails leaving ‘soul-cakes’ a sweet, simple treat outside the home for departed souls to munch on (and leave those in the dwelling alone). However, this developed into a practice by the impoverished and later children. Impoverished people went ‘Souling’ going from day-to-day on November 1st singing ancient songs and prayers for the deceased a people’s doors. They would be rewarded for their songs and prayers with soul cakes (or other small loaves and quick bread). Later, children also joined in to get treats from those whose ancestors they sang and prayed for. In Scotland and Ireland ‘guising’ was also popular. Unlike ‘Souling’ the young people would purposefully dress up and sing, juggle, recite poems, tell a joke, or perform some other kind of ‘trick’ to be rewarded with fruit, nuts, coins, or other small treats. It was believed that these traditions of Souling and guising traveled with immigrants to America and began weaving themselves into the fabric of Halloween. However, the phrase trick-or-treat would not really take hold until the 1930s. Although it got off to a bit of a rough start especially with the sugar-rationing of WWII by the early 1940s trick-or-treating, dressing up in costume, and asking for candy from the community became as popular and American as apple pie (which is to say, like apple pie trick-or-treating had a long and storied history before it became an American hallmark). The above image is by Paul Sapiano. This file is licensed under the Creative Commons Attribution 2.0 Generic license. November 1st is for many a holiday that rivals Halloween in its power and personal meaning. Día de Los Muertos is Mexican holiday celebrated on November 1st through November 2nd. Día de Los Muertos is a time to commemorate death. Although it is often compared to Halloween there is nothing scary about Día de Los Muertos. In fact, it is a celebration that is imbued with love and remembrance of those that have gone. According to the National Hispanic Center, “Essential to Día de Los Muertos rituals and practices is the pre-Columbian belief in the universal duality of life; birth and death, light and dark, joy and pain are critical and necessary partners in the cycle our existence.” The basic premise of Día de Los Muertos is the belief that at midnight on October 31st the souls of the dead are able to reunite with their loved ones. Those who died in childhood are said to come on November 1st whereas adults come down November 2nd. To celebrate their homecoming families construct colorful, merry altars in their homes. These altars are usually decorated with flowers, candles, their loved one’s favorite food, pictures of the deceased, the deceased’s favorite things, and pan de muerto. Pan de muerto is a sweet bread that is made specifically to celebrate Día de Los Muertos. But, Día de Los Muertos is not just celebrated in the home. In fact, loved ones travel to cemeteries to picnic, play music, clean off the gravestones, dance, and sing to the departed. Some even will spend the night in the graveyard. You may be wondering how Día de Los Muertos most unique and identifiable symbol, the Sugar Skull, came to be. They are called ‘Calavera Catrina’ now but before there were sugar skulls, there were Literary Calaveras. Calavera does mean skull but in the 18th and 19th century the most popular way to celebrate the dead on Día de Los Muertos was to write short, silly poems that sarcastically poked fun at the living. In 1947 artist Diego Rivera featured this fancy French skeleton in his famous painting, ‘Dream of a Sunday Afternoon in Alameda Park.’ He named her Catrina and ever since her colorful and extravagantly decorated skull has been made in sugar form. In addition to celebrating at cemeteries, with home altars, and by sharing sugar skulls Día de LosMuertos also involves a larger celebration. Oftentimes, people dress up as skeletons, pain their face to mimic Calavera Catrina, and wear fancy clothes and costumes. Today Día de Los Muertos is more popular than ever...but don’t confuse it for Halloween! The word Jack-o’-Lantern has only been used since the early 19th century in American but the term dates back to 17th-century Britain, where it referred to a night watchman with a lantern tasked on keeping watch through the night. But, the use of gourds lit with candles goes back much farther than either of these terms. The history of the Jack-o’-Lantern is muddled with poor research and confusing accounts. Why? Well because a lot of the tradition occurred in times where recording traditions like this weren’t very common. Although pumpkins are the Jack of choice these days turnips, in pre-Christian Britain, were the most popular Jack-o’-Lanterns. However, beets and other smaller gourds were also popular Jacks to use. The early Jack-o’-Lantern had a similar function to a man with a lantern. During Samhain, which is believed to be when the lanterns were used the most, however, it is not unthinkable that it could be used during other time of the year. These turnips and other vegetables were carved with the most frightening faces a person could imagine. The scarier the better because it was the person’s hope that these carvings would scare away the spirits that would wander by their homes when the veil was thin. These faces were also sometimes illuminated by coals. There is also the myth of Stingy Jack which is also linked to Jack-o’-Lanterns. In Ireland, ages ago, there lived a man named Stingy Jack. Based on name alone I’m sure you can guess he wasn’t a very fun fellow. He was known as the town drunkard and on top of that he often lied, cheated, stole, and played countless pranks on unsuspecting townsfolk. Every night he would walk down the pub and drink until he was kicked out. One night on his evening sojourn to the pub he came across a grotesque and inhuman body lying on the ground. This frightening body was that of the Devil who had come to collect Jack’s soul and bring him to the depths of hell. Shocked, Jack requested one more earthly delight...another drink. The Devil, surprisingly, agreed. So, they both walked to the pub and Jack ordered a drink. When he had finished his ale he turned to the Devil and with some unknown confidence requested the Devil pay the tab. The Devil was equally shocked at this request and wanting to continue the fun he transformed himself into a sixpence so he could walk over and give it to the bartender...but Jack didn’t pay. Instead, he slid the six-pence piece into his pocket right next to his crucifix. Being so close to a crucifix trapped the Devil and lessened his powers. Having all the power, Jack decided to make a deal with the Devil...he’d let the Devil out of his pocket but only if he promised his spare his soul for another decade. The Devil agreed. Ten years pass and a scene much like his first meeting with the Devil occurs. Jack, knowing his time was up, agreed but made one more request. He requested to eat one more able from a nearby apple tree. The Devil, pleased at this simple request, agreed and climbed up a tree. As he was climbing and distracted, Stingy Jack cunningly carved a cross into the tree with his knife. The Devil was stuck...again. And Jack had another barter. The Devil had to promise to never take his soul to hell. The Devil agreed. Stingy Jack finally died after a long life of drinking and debauchery. He was turned away at the gates of heaven but was unable to go to Hell, either. So, he was doomed to wander alone. The Devil, strangely, felt something for the cunning man who had eluded him twice and gave Jack a single, burning ember to help light his way through the dark. When Jack came upon a turnip he hollowed it out, placed the ever-burning ember inside, and created a lantern that would forever guide his way through the darkness of the netherworld. It was then he lost his nickname Stingy Jack and gained a new one...Jack of the Lantern. So how did it come back in the 19th century? Well, Halloween used to be epically pranky. One of the most popular pranks involved carving faces into pumpkins and then using those pumpkin heads to scare people in the dead of night. At the end of the 19th century, their attractiveness and symbology of Halloween took hold in America and they became a common decoration. The above image is from Flickr user Benny Mazur. It is licensed under Attribution 2.0 Generic (CC BY 2.0). You might know November 1st as a day to celebrate All Souls Day or Días De La Muerta but there is another holiday that also takes place on November 1st: Calan Gaeaf. Calan Gaeaf is a Welsh holiday. Like Halloween the day before Calan Gaeaf was called Nos Galan Gaeaf or Spirit Night. Similar to our understanding of Halloween and traditions that shaped Halloween it is believed that Nos Galan Gaeaf is the time when the veil is the thinnest between the living and the dead. On Nos Galan Gaeaf it is suggested that you avoid all places where spirits are likely to gather such as churchyards, graveyards, and crossroads. One of the popular albeit morbid games often played was called Coelcerth. Families would build massive fires and place stones in the fires with their names on it. If any of the stones were unable to be found it was believed that it would mean that the person whose stone was missing would die within a year. Nos Galan Gaeaf was also a time to celebrate the second harvest and the stored food that would see the people through their winter. A harvest feast was typically had and there were dancing and frolicking into the night. In North and South Wales there are two different focuses of Nos Galan Gaeaf that bringing together bring together two important parts of the world, black and white, together. In the south, there is the focus of ‘Ladi Wen’, also known as a Lady in White. Although this Lady in White isn’t our typical Resurrection Mary because Ladi Wen has no head. In the North, there is ‘nwch ddu gwta’ which presented a black sow without a tail. Together they would roam all of Wales together on the night of Nos Galan Gaeaf. They were two terrifying beings so if you weren’t by a raging outdoor fire, in a barn, home, or another dwelling you might be in serious trouble. Nos Galan Gaeaf was also a good night to try and test future-telling. It was said that boys could ten ivy leaves throw away one and put the rest under his head before he sleeps to see his future. Girls should train a wild rose to grow into a hoop then on Nos Galan Gaeaf she should climb through it three times, cut it in complete silence, and go to bed with its length under her pillow. Around the 18th century as Wales grew less and less rural the traditions of Nos Galan Gaeaf began to die away. However, Nos Galan Gaeaf night is still not wholly forgotten and remains a night to think about strange spectres, headless wraiths, and foreboding tailless sows. The above image is unrelated to the story and is by Flickr user aseop. It is licensed under Attribution-ShareAlike 2.0 Generic (CC BY-SA 2.0). A common Halloween party tradition is bobbing for apples. But, how did this strange tradition begin? While it is a fun party game today its origins and development can be traced back to the Samhain festival, ancient Rome, and has its roots in divination. The Romans originally brought apples to the Celtic people when they covered Britain. One of the many things they brought with them were the apple trees and a goddess of beauty and fertility, Pomona. The Celtic people had been celebrating Samhain long before the Romans came and the Romans saw a way to blend the two cultures through apples. When the Celts first encountered apples they couldn’t help but notice that when you cut an apple in half its seeds form a pentagram. The pentagram in Celtic culture was a fertility symbol and since Pomona, the Roman goddess represented by the apple tree is also a fertility goddess apples seem to be a highly potent fertility symbol. During Samhain, it was believed that bobbing for apples could be a divination tool. Back then, bobbing for apples was for a very specific set of people: unmarried young people. Young unmarried people would try to bite into an apple and it could either be floating in water or hanging from a string (it is usually called snap apple when on a string). It was said the first person to bite into an apple would be the next one to marry. This is the most simplistic take on the tradition. But, the game doesn’t have to be over when one person gets the apple. The game can also be held en masse. For example, if multiple young, unwed people are bobbing at once the moment they catch one they could peel it quite carefully and then wrap the peeling (all in one ribbon) around their head. Once they’ve wrapped it they are to throw it over their shoulder. Once the peel is flung the shape it lands in will be representative of the first letter of their true love’s first name. Ann English tradition-spin on bobbing for apples doesn’t really look like the classic bucket full of water and apples. In fact, apples are strung up and then twirled so they spin in front of a lit fireplace. The order the apples fall will tell the order in which the people that hung them will be married. Other times the divination aspect is slightly altered because the young names of those bobbing would also be written or etched into the apples. So, if you watched carefully enough you could aim to snag the apple with your lover’s or crush’s name! Snap-Apple Night, painted by Irish artist Daniel Maclise in 1833. It was inspired by a Halloween party he attended in Blarney, Ireland, in 1832. It is liscensed in the public domain. Now that we’re just one week away from Halloween I wanted to change up #Blogstonishing a bit. This last week will focus on exploring Halloween traditions and similar celebrations in other cultures. We’re starting with The Hungry Ghost Festival. The Hungry Ghost Festival starts a few months before Halloween but shares many similarities. The Hungry Ghost Festival takes place on the 15th night of the 7th Chinese month, which is usually in mid-to-late August. However, sometimes it is held in early September. Also known as Yu Lan it has its roots in Taoist and Buddhist beliefs. On this day the gates to the spirit world are opened and the deceased are permitted to walk the earth once again. In fact, Anven Wu Yim-ching, a director the Federation of Hong Kong Chiu Chow Community Organizations, says “It can be just like Halloween,” and even included a Ghost Festival costume contest in 2015. Similar to early Western conceptions and festivals (and what would later come to form Halloween) The Hungry Ghost Festival takes place in a liminal space where the dead have free reign over the living world once again. It is the practice to make offerings in order to appease and pacify these ghosts and ensure the living’s safety. Hungry Ghost Festivals have their origin in the Ullambana Sutra. According to this sutra one of Buddha's disciples, Mahamaudgalyayana, learned that his mother who had passed away had been reborn as a hungry ghost. 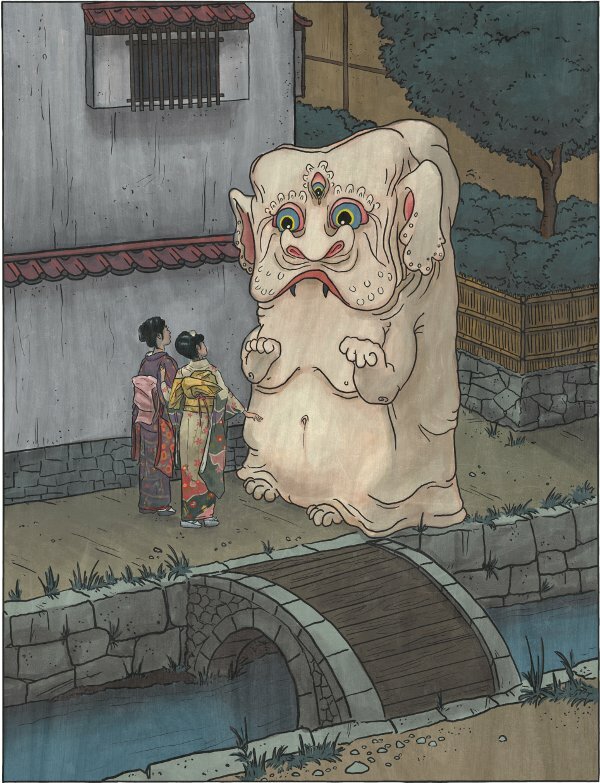 Hungry ghosts, according to legend, are beings with huge stomachs but their mouths are too small and their neck too thin to take in enough food and so they live with an insatiable craving. Some believe that you can become a hungry ghost is you live a life of gluttony, obsession or addiction. Mahamaudgalyayana tried to ease his mother’s suffering but when he offered her food it transformed into burning coals. So, he turned to the Buddha to learn how to help his mother. Buddha told him that on the 15th day of the 7th month the Buddhist community should fill bowls with fruits and other food. In addition to physical food spiritual offerings of incense and candles should also be made. Then, they should place the bowls of food in front of an altar and recite prayers en masse. The ghosts who arise will receive the food and be blessed for a hundred years. When the ghosts of your ancestors arise on this day it is important to make offerings to them. Should you ignore Ghost Month and especially the Hungry Ghost Festival your ancestors might curse, haunt, or otherwise malign you. Popular gifts include Zhizha (hell money, which dates backs to 1000 BC) which should be burned so it can be transported to the underworld and ghosts can use it as they please. According to Terence Hang, a sociologist from the Singapore Institute of Technology, “Individuals now purchase and burn whatever is fashionable to consume in a contemporary, globalized society. One can get hold of paper iPads, paper credit cards, paper Rolls Royces, and more.” Paper effigies of everything from popular beers to TVs can be found and offered. However, real food is still used. If you are going to use real wood you should place fresh food outdoors near your home (maybe on a porch or balcony). During this time of year, according to Louise Hung, “For the entire ghost month, my street in West Kowloon was never without takeaway boxes of food placed on the sidewalk after dark. Some laid out red cloth or flowers for the food to sit on, others placed bottles of water or beer alongside the offerings. It was all about giving people’s ancestors their favorite foods, or pleasing passing spirits so they wouldn’t bother the inhabitants of someone’s home or shop.” She noted that she rarely saw leftovers or trash left out in the morning, save for a few food items that may have gotten run over in the night. I have also read on various other sites (sources linked above) that you should not buy a house during this time, enter a romantic relationship, or make big moves (like a marriage proposal or trying to start a family) within an existing romantic relationship. The above image is licensed in the public domain. It is entitled the Second section of the Hungry Ghosts Scroll located at the Kyoto National Museum. The scroll depicts the world of the hungry ghosts, one of the six realms of Buddhism and contains tales of salvation of the hungry ghosts. This particular section explains how those who have been born as hungry ghosts are saved by the offerings of the living. It relates the story of one of the thirty-six types of hungry ghosts who constantly seek water to drink. The central scene of this section shows people pouring water on a funerary marker for the ullambana festival for the dead. The whole scroll has been designated as National Treasure of Japan in the category paintings. It was possibly part of a set of scrolls depicting the six realms which were kept at Sanjūsangen-dō. Cemeteries allow a host of meaning and activities to be grafted upon them. For some, they are a beautiful, bucolic place to memorialize loved ones, for others it is a place to go ghost hunting and catch a scare, others treat it as a place to learn more about the past, and for even mit is a final resting plce. Living human beings place many more activities, meanings, and symbolism onto graveyard and cemeteries...but what about the meaning that gravestones are showing us? Why shouldn’t we analyze headstones, cemeteries, and graveyards from the last 300 or so years with a similar care and interest that we show to burial mounds and graveyards of thousands of years past? How we mark our dead is a cultural phenomena that is easy to overlook and even easier not to think about...for who among us wants to plan the design of our tombstone? So springs the study, analysis, and interpretation of cemetery art. These symbols - from crosses to flowers - can tell us even more about the deceased than the written inscription on their stone. This is especially important when so much of the writing has become unreadable or never existed in the first place. One of my favorite that I had come across was something I had seen several times before, but never quite understood it: a torch turned upside down. Why put such a puzzling image to mark someone’s final resting place? Well, because it symbolizes eternal life. How? Because despite it’s inverted position, the flame continues to burn on in defiance of natural laws. Perhaps people buried under these symbols were visionaries. Plants and animals also play into the symbolism. For example, roosters and dolphins signify a resurrection. Lambs usually indicate the death of a child whereas owls symbolize wisdom and old age. Oaks highlight supernatural power, violets highlight faithfulness, and wreaths mean victory in death. Another favorite was the butterfly. Perhaps it is my own bias peeking through but I always think butterflies seem quite cheesy. However, the Greek word for butterfly is “psyche.” If you’ve ever dabbled in Greek philosophy, you might know that psych is also the greek word for soul. To take it even a step further butterflies begin life as caterpillars, cocoon themselves (almost as if in a coffin), and remerge as butterflies. In a strange way, is the grave acting as some sort of cocoon for a grander experience? Even more interesting, according to 99% Invisible, “Others symbols are tied to orders, institutions and professions, like stumps associated with the Woodmen of the World; squares and compasses with Masonic orders; a mortar and pestle with pharmacists; a palette and brush with artists; anvils with blacksmiths; anchors with sailors; and linked chains with the Independent Order of Odd Fellows.” Continuing on tha idea, Eagles often symbolize a military career. What other symbols have you noticed are prevalent in cemeteries and graveyards? What do you think they could mean? This image of the German cemetery in Sighișoara, Romania, taken by Myrabella. It is liscensed under CC BY-SA 4.0.